Araby Research Papers delve into a book by James Joyce about the life of a young boy in Dublin and his epiphany. World literature courses look at novels by writers like James Joyce because their themes provide excellent life lessons. Paper Masters writers explore the themes within Araby by flushing out the important points that Joyce attempts to make. The meaning of James Joyce’s Araby is revealed in a young boy’s epiphany as the story ends. The young boy who narrates the story is going through a personal journey. He experiences his first love, and then he experiences feelings of sadness and despair. The main theme in Araby is the boy’s discovery of the differences between ideals and real life. While the boy narrates Araby, he tells his readers about the world in which he lives. He seems to be effected by religion at first, but his feelings change throughout Araby as he experiences desire. At the end of Araby, his feelings are different than they were during the story. James Joyce describes the boy’s life effectively by contrasting the romantic image of the girl he loves with the harsh reality of Dublin, with its “flaring streets…drunken men and bargaining women, amid the curse of labourers”. The boy lives in a house with “high cold empty gloomy rooms” where a priest had died, but this is all overpowered by his feelings for the girl. Through everything, he sees nothing but her image. The girl provides a sense of happiness and beauty for the sensitive boy. The boy is “searching for principles with which to make sense of the chaos and banality of the world” and the girl is one of those principles. Since the boy’s journey is Araby’s most significant element, it is important that Joyce uses first person narration. The majority of the conflict takes place inside the boy’s mind as he describes his experiences. It is easy to understand what he is thinking because he is describing it firsthand. The boy talks about the girl when he sees her: “Every morning I lay on the floor in the front parlour watching the door,” he says. It is almost as if the boy is saying that he worships her. He is obsessed and when she finally talks to him it is difficult for him to respond without fumbling his words. At first, the boy seems to be influenced by religion. His education takes place in a Catholic school. 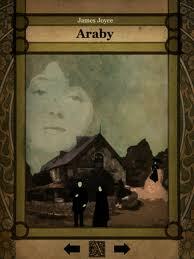 The story’s title Araby shows how the boy’s desires for the girl plays a role in the boy’s feelings toward religion. He explains how the mere meaning of the word Araby has a great effect on him. The thoughts of the character going through an epiphany are more important than the actions that lead to an epiphany. The narrator in “Araby” experiences an epiphany when he arrives at the bazaar with high expectations that he will find a new and exotic world where he can buy an appropriate gift for the girl who has filled his thoughts for so long. His hopes for a glamorous adventure are obliterated by the sounds of the familiar accents of his own community speaking unimportant phrases and selling mundane merchandise such as porcelain vases and tea sets. The anguish and anger he feels at missing the adventure of his expectations lead him to feel despair that any relationship with Mangan’s sister will only lead to disappointment rather than an escape from the drudgery of daily life in Dublin. His frustration is intense as he realizes that escaping the monotonous rituals of daily life is impossible. Analyzing a Short Story Research Papers delve into an order placed on an undergraduate level with specific guidelines on how to complete the project. Order a research paper on short stories from Paper Masters. Research papers on James Joyce's Eveline identifies an aspect of the text and develops an interpretation of the story. James Joyce Ulysses research papers examine the eighteen chapters of the modernist novel by James Joyce. The Dead James Joyce essays examine a short story by Irish writer James Joyce. “A Little Cloud”, by James Joyce, Research Papers look at a story about self-revelation that was written by James Joyce. Coming of Age Stories research papers compare the aspects of the coming of age stories such as Whale Rider and the House on Mango Street. Paper Masters writes custom research papers on Araby and delve into a book by James Joyce about the life of a young boy in Dublin and his epiphany.